Drinking and walking should go together. Your body will lose water when you walk and you can end up dehydrated. But it is also important that you don't drink more than your body needs. Learn how much and what to drink before, during, and after your walking workouts. It's good to be well-hydrated before exercise. 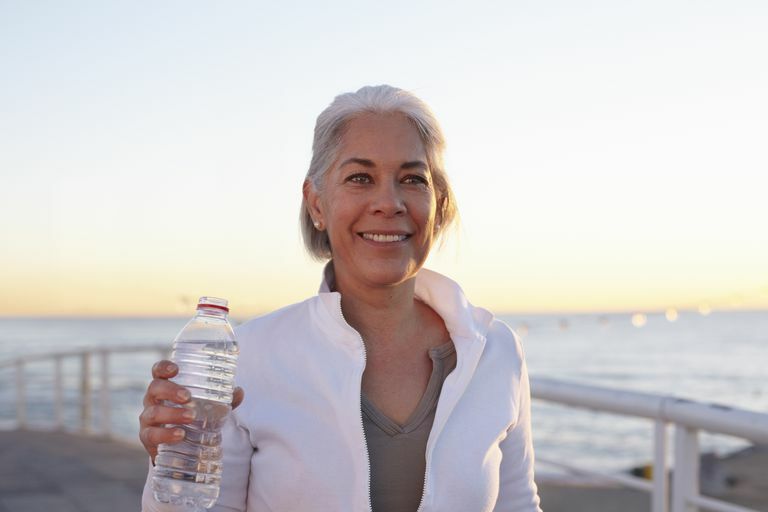 Drink Before You Walk: Prepare for your walk by drinking a tall glass of water (17 ounces or 500 milliliters) two hours before your walk. This will allow time for any extra to pass through your body and be eliminated in your urine before you hit the trail. Plan for More Water: Carry water with you or plan for water stops along the route where you will be able to get a full drink of a cup of water every 20 minutes. A water fountain may not be able to deliver enough water for you to get a full cup. Use a walking water calculator chart to find out how much water you should be taking along to ensure you have enough at hand. Water: For walks of two hours or less, plain or flavored water is the best drink. Electrolyte Sports Drinks or Salty Snacks During Long Walks: When your walk is going to be longer than two hours, a sports drink or salty foods such as pretzels can help with water absorption in the body as well as replacement of salt, plus provide carbohydrates for energy. Drink When Thirsty: The old rules of drinking before you were thirsty were tossed out in the early 2000s. The USATF and the International Marathon Medical Directors Association say walkers and runners should trust their thirst mechanisms and drink when thirsty. Take a Larger Drink: An interesting study found that water and other fluids will be absorbed faster if you drink a cup or more at one time, rather than taking in water as small sips over a long period. Drinking When Sweating: You are likely to get thirsty more frequently when you are sweating, so be prepared to have more access to fluids when you know you will be sweating. High Altitude and Weather Conditions: You lose even more fluids at high altitudes, in hot conditions, and when the humidity is low, and you may need to drink more than usual. Again, let thirst be your guide and drink as soon as you feel thirsty. Flavor Your Water: Make your water taste good so you will want to drink more. You can add a squirt of lemon or other flavorings for your water. When you are done exercising, finish with a drink. Electrolytes: After a long walk, do not overdo on plain water, use sports drinks, and/or salty foods to replenish salts as well. If you drink too much fluid (water or sports drink), you can end up diluting your blood sodium. This is a common problem of slower runners and walkers at races. You don't need any special type of water to stay properly hydrated. Tap water from a municipal water supply in the U.S. or Canada is perfectly fine for most purposes. Do not drink water from a lake or stream unless you filter or purify it. In many places, there are nasty parasites such as Giardia lamblia and Cryptosporidium in the "unspoiled" mountain streams. The water is naturally contaminated by squirrels and other small animals. Hew-Butler T, Rosner MH, Fowkes-Godek S, et al. Statement of the Third International Exercise-Associated Hyponatremia Consensus Development Conference, Carlsbad, California, 2015. Clinical Journal of Sport Medicine. 2015;25(4):303-320. doi:10.1097/jsm.0000000000000221. Leiper JB. Fate of Ingested Fluids: Factors Affecting Gastric Emptying and Intestinal Absorption of Beverages in Humans. Nutrition Reviews. 2015;73(suppl 2):57-72. doi:10.1093/nutrit/nuv032. Maharam LG (chair), Hew T, Siegel A, Adner M, Adams B, Pujol P. "IMMDA’s Revised Fluid Recommendations for Runners and Walkers." IMMDA. 6 May 2006. (current as of 2017).